In small bowl, combine 1/4 cup apricot preserves and curry powder. Brush over both sides of pork chops. Place on pre-heated medium-hot grill. Cook on both sides for 8 to 10 minutes or until internal temperature as measured with an instant-read thermometer reaches 160 degrees F.
Meanwhile, combine apricots, preserves and cilantro. 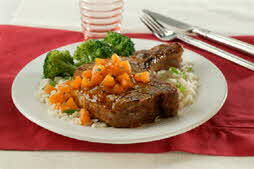 When ready to serve, spoon Chunky Apricot Sauce over pork chops. Serve with steamed brown rice and broccoli. Made famous in the television commercial, Pork Loin and Ms. Apricot combine for a mouth-watering match made in Hollywood, in a relationship that’s certain to enliven up your dinner meal.